Following the CQ WW contest I made a few small changes to the 80 meter vertical. These should be sufficiently interesting to others to justify this follow up. The 8 radials were not equally spaced when the antenna was first built. I was in a rush and so used a protractor to estimate 45° intervals (8 x 45° = 360°), and at least ensuring that opposite radials were aligned to be 180° apart. To set my mind at ease I decided to do a better job of it. The radials are easy to move since they lie on top of the sod. Given the radial length and radial number it is easy to calculate and lay them out symmetrically to ensure equal currents. The process is described in many amateur radio texts, and is in any case easy to derive if you have a rudimentary knowledge of trigonometry. What you do is use an equation to calculate the distance between the ends of adjacent radials. I derived it since it was easier at the time than hunting around for the right book and searching for the equation. For my 8 radials of 8 meters length the distance is 6.12 meters. With than distance calculated you start with any radial and a tape measure. Take the adjacent radial in hand and find the point where the radial end and measured distance coincide. Repeat for the remaining radials. 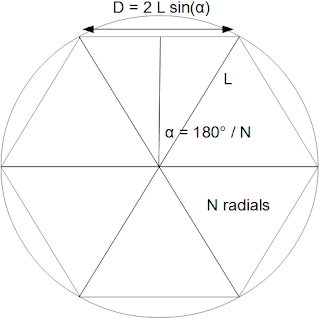 To be on the safe side check that opposite radials are collinear; this requires an even number of radials. After this task was completed I checked the SWR. Resonance had shifted upward by 50 kHz. This was not unexpected since published experiments confirm that symmetry affects radial current equalization, an effect that increases in magnitude when the number of radials is small. Ground loss is minimized when radial currents are equal. Although the radial symmetry effect did not require retuning the antenna it did become a concern when the second inverted vee for 40 meters was put up. Due to the interaction the 80 meter SWR increased to between 1.7 and 2.0 from 3.5 MHz to 3.8 MHz. There was no time to remedy this before CQ WW. For that contest the problem was not significant since I knew I'd be making very few 80 meters QSOs with QRP SSB. The L network box was unsealed and inspected. For a change it was dry inside. The weatherproofing is working. I knew that to lower the frequency of minimum SWR I'd have to reduce the value of the series capacitor. I disconnected the three 82 pf capacitors that parallel the 500 pf doorknob capacitor, keeping two of them in parallel so that I had 3 combinations of capacitance to try. To adjust the coil without unsoldering the tap I compressed the coil to increase the inductance. From playing with TLW I expected this to be the required direction of change. This turned out to be the case. I folded up short lengths of cardboard to adjust the compression, although any dielectric material can be used. A business card separates the coil and coax connector. 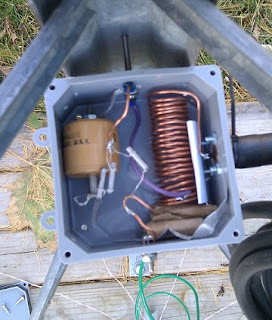 By trying various combinations of capacitance and coil compression I was able to find one that resulted in an SWR below 1.5 from 3.5 MHz to 3.8 MHz. Mission accomplished I resealed the box and put the finishing touches on weather sealing the boot on the coax connector. There is common mode incursion into the shack from the vertical, just as there was with the loaded half sloper. The only place I've noticed it is the behaviour of the Ham-M rotator control head. When I had the half sloper the lamps in the meter would dimly light when running 100 watts. The vertical affects the meter deflection. As discussed in the original article I knew very well that I'd have common mode problems due to the overhead runs of coax and control cables from the tower to the house. The coil I made with the extra coax to the vertical feed point doesn't accomplish much, just as I predicted. I decided to conduct an experiment. I dipped into my junk box and pulled out two snap-on ferrite cores. Over the years I have kept some of these around to deal with EMI on stereos, telephones, televisions and other household appliances, either in my house or those of my neighbours. 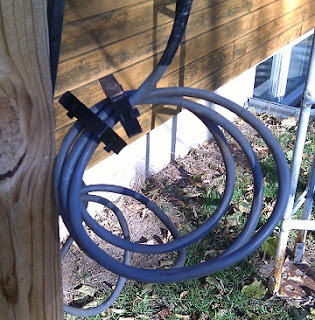 I was able to fit 4 turns of rotator cable through the cores, placing this choke coil near the cable entrance to the house. The result was...interesting. I didn't expect a miracle, since this choke is not really adequate for 80 meters, only to see if it could achieve some common mode suppression. It didn't. Rather than reduce the problem it just changed it. Meter deflection continued as before, except at different frequencies -- the rotator EMI is frequency dependent. Sometimes the meter moved left and sometimes right, sometimes a little and sometimes a lot. My conclusion is that the common mode is also coming in on the outside of the coaxial cables (RG213), so that the choke on the rotator cable only serves to modify standing waves on all the cables. I have no good solution to this other than a massive effort to add chokes on all cables that are suitable for 80 meters, or to bury the cables. Neither is an option in my present situation. I can leave with it. However, running a kilowatt would change my opinion. I can of course use capacitors on all the rotator cable wires to bypass RF to ground. That won't solve the common mode problem but could make it less visible; out of sight, out of mind. Other than some cleaning up I am done with antenna work for the season. The weather is unseasonably warm this week, which is great for antenna and tower work, except that I don't need it. Everything is where it needs to be, performance is as good as it will get and all connections are waterproofed. Now I need only work on the shack electronics and software in preparation for upcoming contests and DXpeditions.